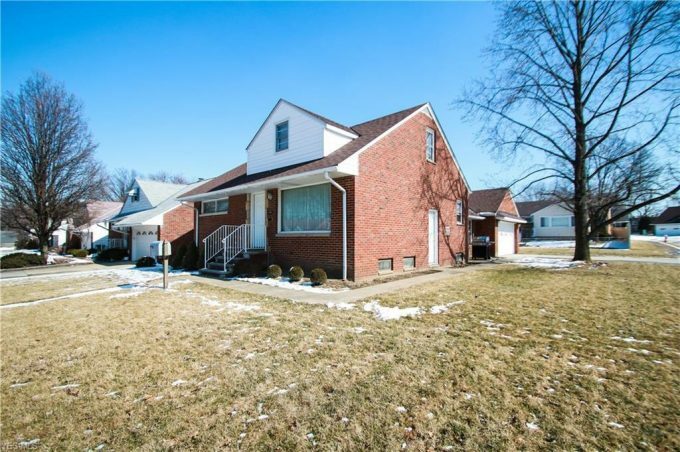 Welcome to this immaculate brick Cape Cod-style home just off Chardon Road in Euclid. This well-maintained, corner-lot property has a two car garage with a breezeway connecting it to the home. Recent outside upgrades include: 1) the front lawn and landscaping at the front of the house have been re-planted; 2) the garage floor, driveway and sidewalk to the front door were all replaced with new concrete in the last few years; 3) the front steps were replaced and new aluminum railings were installed; 4) All exterior doors have been replaced with steel security doors. Inside the home, the main bathroom and two bedrooms are on the first floor, with a third and possibly fourth bedroom/office and a half-bath on the second floor. There are numerous closets with loads of storage space located throughout the house. The kitchen features updated kitchen cabinets and counter-tops, and all appliances will stay. There is a finished basement with laundry area, and the current owner added a water conditioner to insure soft water for bathing and washing clothes. This home has been continuously updated by the current owner and is absolutely move-in ready.